LEESBURG — The winter weather breaks and there is a hint of cool spring in the air. There is that smell that only horse lovers really know: fresh shavings in the barn and the fragrance of sweet hay that exudes from the beautiful creatures, creatures that are in many ways like people. They have distinct personalities, unique behaviors and habits. Sometimes the horses behave mysteriously or mischievously or just badly. Enter Michael Gascon, The Horse Guru. He has been called “a true Mississippi original” from Poplarville, Miss. On March 9-10 Gascon, The Horse Guru, will be in Leesburg. Gascon is a fifth-generation horse whisperer. He has been riding “since before I can even remember.” He’s studied at The School of Equestrian Arts in Spain and traveled extensively to England, Germany, Denmark, Mexico, Canada, Mongolia and Australia, learning, competing and training horses. He says he wants to learn about other countries and their cultures as related to their horsemanship. 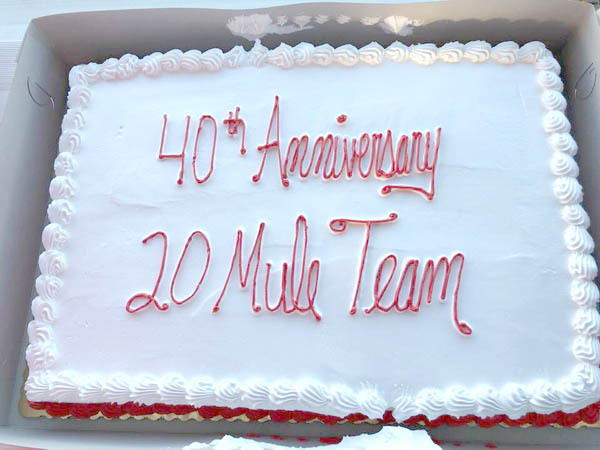 The 40th anniversary of the 20 Mule Team ride took place in near-perfect weather in Ridgecrest, California, on February 23, 2019 with distances of 35, 65, and 100 miles. The trails were the same that will be covered in the AERC National Championship rides on October 31-November 3. Chris Martin's Monk, ridden by Ann Hall, was third cross the finish line but ended up the winner, in a ride time of 13:09, when the first 2 finishers were pulled. Second place went to Melissa Montgomery aboard West Winds Dragon in 13:52. Justin Loewen and Par Devant finished third in 15:35. Fifth place Susie Kramer and A Ali Aseel took Best Condition. It was the gelding's first 100 mile ride. 36 started the 100, with 22 finishing. Dominique Freeman and Rising Heat won the 65 miler - and got Best Condition - in a ride time of 7:15. Sheri Weast and AA Arikhem finished second in 7:17, and Allan Horn and Shez Mostly Zipped finished third in 7:45. 24 started the 65, with 23 finishing. Lauren Horn and her mustang Midnight Special won the 35-mile ride in a ride time of 4:25, and got Best Condition. Carolyn Hock and SX Whisper finished second, and Alissa Stephan and Limited Edition finished third. 19 riders started the 35-mile ride, with 18 finishing. Lexington, Ky. – US Equestrian is pleased to announce the members of the team staff for U.S. Endurance for 2019. Mark Dial (Aubrey, Texas) will continue to serve in his role as Chef d’Equipe and Technical Advisor for the Young Rider and Senior teams. Stay up to date on U.S. Endurance by following USA Endurance on Facebook and US Equestrian on Instagram and Twitter. Use #USAEndurance. SACRAMENTO, Calif. – The Bureau of Reclamation, in coordination with California State Department of Parks and Recreation, will add railing-safety improvements at No Hands Bridge in Auburn. Work is expected to begin in August and continue through fall 2018. The bridge will remain open to pedestrian and equestrian traffic during work activity, scheduled from 8 a.m. to 3 p.m., weekdays only. Reclamation contractors will attach chain link fencing to the railing interior using metal fasteners that could be easily reversed in the future. No Hands Bridge, also known as Mountain Quarries Bridge, was constructed in 1912 and is part of a popular hiking trail along the American River’s North Fork, located within the Auburn State Recreation Area. State Parks manages recreation at the ASRA under an agreement with Reclamation. Broxton Bridge Plantation, USA SE Fundraisers. Ehrhardt, SC. 25 and 26 January 2019. Broxton Bridge Plantation was pleased to host one of two observation events for the 2019 World Young Rider Championships which will be held in Italy in September of this year. There were a total of 10 young riders over the two days of CEI 1, 2, 3* races. Kate Bishop from North Carolina on LR April Breeze, owned by Lisa Green, were the dominant pair earning a COC in a ride time of 8:00:42 on day 1 more than one hour ahead of the next pair Annie Whelan of Kentucky on her horse Wallace Hill Sundance and Mollie Quiroz from California on Tracy Vollman’s horse RA Karim. Kate was the only YR to earn a COC over the two days. We talk about three new endurance rides in the NW Region and ride strategy to make sure you and your horse complete your ride. Guests include Erin Riley, manager for Torre Creek Pioneer ride in Eureka, NV and Jessica Huber with the Idaho Ironhorse rides. Scottsdale, Ariz. – The legendary and culturally famed Scottsdale Arabian Horse Show is set to begin on Thursday, February 14, through Sunday, February 24. The 64th edition of the event is an 11-day showcase of the beauty and diversity of Arabian and Half-Arabian horses. 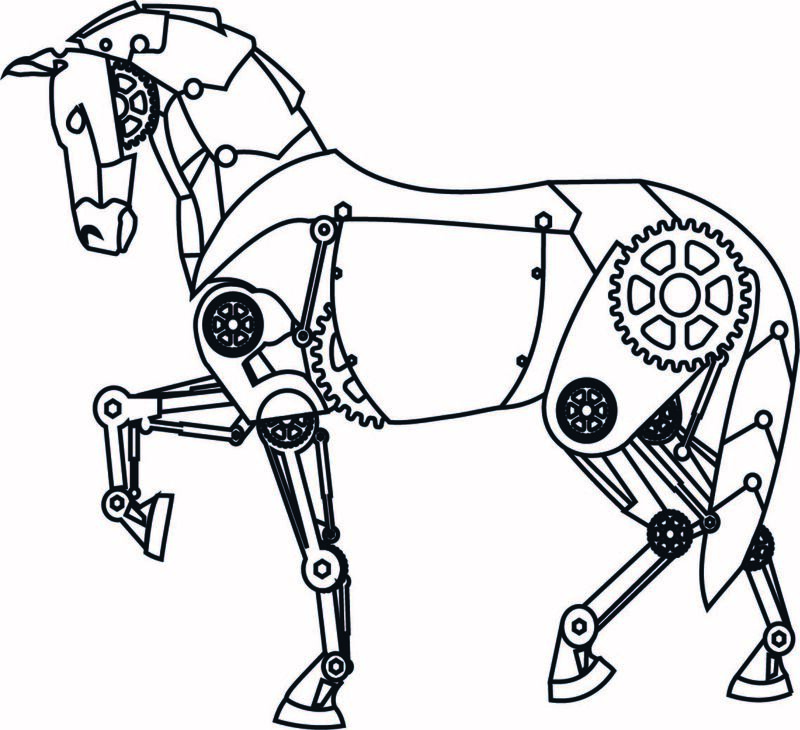 Hosted by US Equestrian affiliate, the Arabian Horse Association’s (AHA) club, the Arabian Horse Association of Arizona (AHAA), the show is held on the WestWorld show grounds, with over 2,000 horses and nearly 10,000 entries set to exhibit. Approximately 1,200 classes for youth, amateur, and professional exhibitors will put the athleticism of these desert-bred horses on full display. Six show rings will run throughout the week, hosting Western and hunter pleasure classes, native costume, driving, jumping, dressage, sport horse under saddle, halter, reining, and more. Arabian endurance legend Auli Farwa (aka "Far") will appear at a meet and greet at the Scottsdale Arabian show on Wednesday, February 20th in Scottsdale, Arizona. The gelding will be in the Family Fun Zone Tent from 3-4 PM. 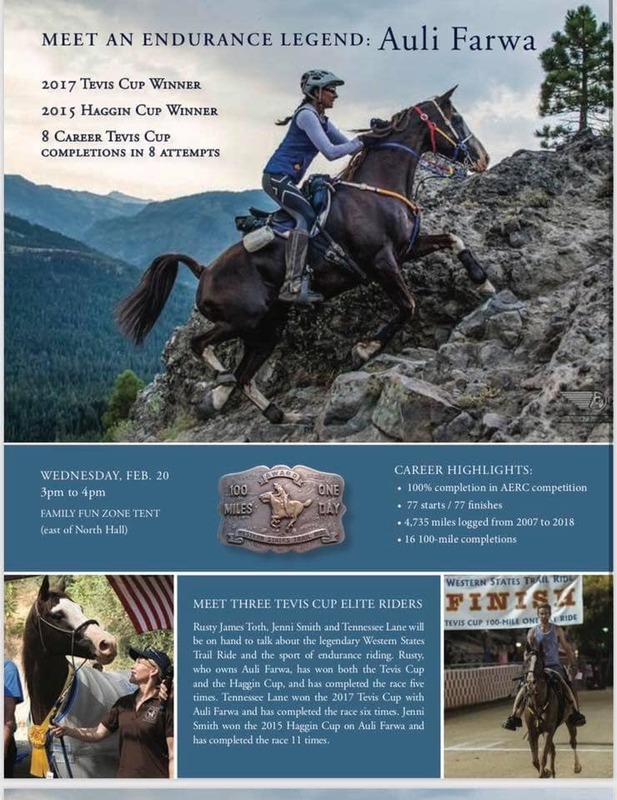 This coming 19-year-old gelding has made an impressive mark on the sport of endurance with an outstanding record: 100% completions in AERC endurance ride starts (77 for 77), 4735 miles, and 16 100-mile completions including 8 finishes in the renowned Tevis Cup. Far won the Tevis Cup's Haggin Cup (Best Condition award) in 2015 with rider Jenni Smith, and he won the 2017 Tevis Cup with rider Tennessee Lane. Accompanying Far will be accompanied by his favorite humans, Smith, Lane, and owner Rusty James Toth. Mark your calendars to meet the Endurance legend! Ride. Integrity. Determination. Education. SIgn up for the AERC Convention! Endurance.net would like to extend a special thank you to our advertisers. At Endurance.net we strive to provide timely local and world-wide endurance riding news, stories, profiles, and educational material to keep our readers and subscribers up to date with the sport of endurance. We are happy that you have chosen to be a part of our effort. We recognize and appreciate all you do to support the sport of endurance riding with us! So thanks to each of you. May we all have a great many trail miles in 2019. 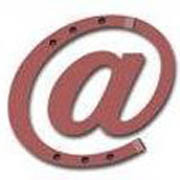 For information regarding advertising on Endurance.Net, please contact Steph Teeter, steph@endurance.net.